Tennent’s is to be distributed across China after owner C&C Group agreed a strategic partnership with Beijing-based import business Vandergeeten. Irish firm C&C Group and Vandergeeten have signed a three year distribution agreement for the Tennent’s brand portfolio in the world’s biggest global beer market. Joris Brams, Managing Director of C&C Group’s International Division, said the company saw the deal as part of a long-term growth plan for the Tennent’s brand. “This is a fantastic opportunity for C&C Group to work in partnership with a well-established company in China with a very strong reputation in the drinks business,” he said. Initially Vandergeeten will launch Tennent’s 1885 Lager, Tennent’s Stout, Tennent’s Whisky Oak Aged Beer, Tennent’s Scotch Ale and Tennent’s Extra into both the on premise and off premise channels nationally in China. The deal is the fourth such partnership C&C Group has signed for Tennent’s in recent months. Last week it revealed Scotland’s top selling beer brand would be brewed in India in a deal with Mahou San Miguel. 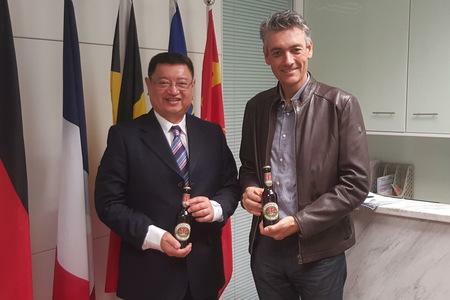 Vandergeeten began importing from Belgium and Western Europe in 1994 and now has more than 90 brands in its portfolio, making it one of the most active distributors of specialty beer in China. To achieve nationwide distribution for its range, Vandergeeten said it had offices in Beijing, Shanghai, Guangzhou and Shenzhen, as well as regional representatives and sub-distributors covering all of China. C&C’s strategy for growing the Tennent’s brand internationally comes as global alcohol consumption fell for the first time this century. Euromonitor International recently reported that alcohol in China declined by 3.5 per cent because of a heavily-reported clampdown on extravagance. C&C Group recently reported overall group operating profits down 10.3 per cent to €103.2m for year ending February 29 2016. It posted revenue of €662.6m. Encouragingly though, the group saw volume growth in the potentially lucrative Asian market rocket by 66 per cent. Currently, just ten per cent of Tennent’s is sold outside of the Scottish market. C&C Group chief executive Stephen Glancey said that although the export market for Scottish alcohol was dominated by whisky, there was increased demand for Scottish beer brands. “The desire for authentic high quality Scottish brands travels across the alcohol space and we are seeing increased potential for the Tennent’s brand in new markets. Tennent’s has a good franchise because of the red ‘T’ and it’s been around historically, and Scotland is well respected for its food and drink,” he said.